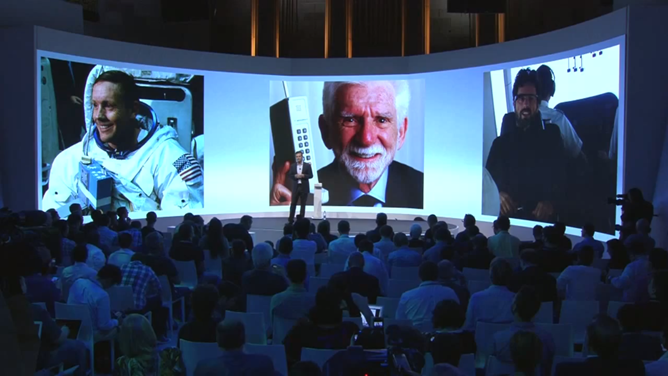 From left to right, for those who weren't watching, that is Neil Armstrong, Martin Cooper, and Sergey Brin. Motorola pointed out (bragged, really) that the first words Armstrong spoke on the moon were relayed by a Motorola device. Martin Cooper, likewise, is an incredibly influential figure in the mobile landscape, having led development of the DynaTAC, one of the earliest Zack Morris cellular phones for consumers. Dr. Cooper was actually present for the presentation, which only made it all the more exciting. And of course, Sergey Brin was lauded to the crowd for embodying the engineering spirit at Google that led to a team of skydivers participating in Google+ Hangout while freefalling towards the earth via Project Glass. If you want to inspire people, you can't do much better than putting a lead developer of the modern mobile phone, a co-founder of one of the most influential software companies on earth, and the first man to walk on the moon in the same slide. You cannot look at this image and not appreciate, on some level, the awe-inspiring magnitude of the future we're living in. The fact that it indirectly ties Motorola's past to Google's future is just icing on the symbolism cake. The only way Moto could've tugged on the heartstrings of tech enthusiasts—and, indeed, all of humanity—more is if they had a surprise visit from the Mars Rover. Sure, there was a bit of snark indirectly aimed at Apple, but step back a bit here and take a look at the overall message. It's easy to think of Motorola as being the company that can't seem to turn off Caps Lock. In fact, it's easy to think that most devices we see are "crap." Just take a look at some of the reactions to the RAZR MAXX HD on Twitter today for example. But step back for just a moment and realize how far we've come in so short of a time. The mobile landscape has changed so dramatically and so quickly that the first man to ever make a phone call on a consumer-oriented phone is still around to see the announcement of new devices today. It's safe to say that Motorola isn't commanding the same level of inspiration that it used to. In fact, in recent years, the company has been very close to bankruptcy. However, what this portion of the presentation today demonstrated more than anything is that, in the wake of the restructuring, the Google acquisition, and even the layoffs, the new Motorola hasn't forgotten its engineering roots nor the kindred spirit it has in Google. The full event, for those who missed it. The next major portion of the presentation discussed what users want in a smartphone. Most presentations will discuss what customers want in a product, but the purpose is usually to tout a specific feature. While that was somewhat true of today's devices, there was a sense that Motorola was talking about more than just the new RAZRs. The company's newly minted CEO talked about the "big bets" they have made—speed, power management, and Android—as a template for where Motorola's engineers will pursue innovation. He also made waves by making some pretty lofty promises. First off, all the devices announced today will have developer editions available sans locked bootloaders (though that might be more accurately described as a compromise). 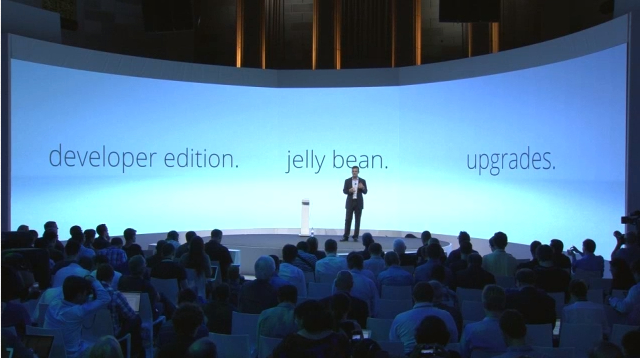 The second promise was that all the devices announced today would receive Jelly Bean by the end of the year. Which honestly disappointed plenty of people. The third promise, though, almost makes up for it. Motorola announced that it will upgrade "most" of the devices it launched in 2011 to Jelly Bean "very soon." For those that cannot be upgraded, however, Moto promised a $100 credit for anyone upgrading to any of the devices announced today. Unfortunately, you'll have to turn in your old phone to get the credit. This makes it little better than a trade-in program, but at the very least, it's coming from a manufacturer, not a carrier. Until we find out which phones you can trade in, we can't be sure if you'd be better off just selling it on craigslist (though it's likely that the devices that can't be upgraded to Jelly Bean are also the phones worth the least money). Still, for those who don't want to go to the trouble, it's a nice option. 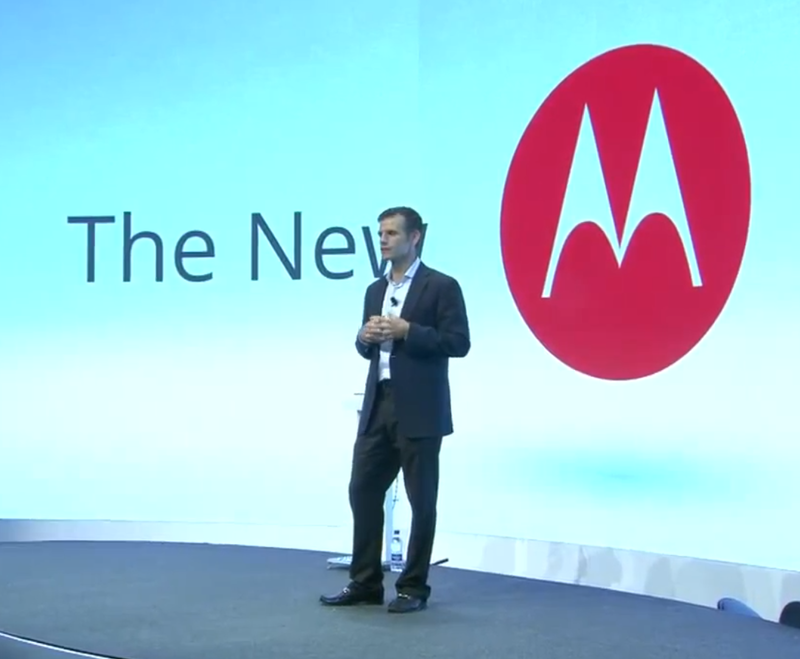 Oh, and for those counting, this means you could get a RAZR M for free on contract. It's not a bad deal. Put all this together, and Motorola has painted a picture that looks very similar to what users have been wanting for a while: the option to unlock bootloaders (even if it does come at an unsubsidized price), faster devices, longer battery life, and a priority on upgrades if they can deliver. And if they can't, there's at least a program in place for an alternative way out. Which is more than we can say for most companies. Oh, and did I mention that most Motorola devices now use a version of Motoblur so pared back it's almost indistinguishable from stock Android? It's actually a pretty great vision of where Moto should head. Of course, the picture is great. The delivery would be even better. The RAZR M's "edge-to-edge" display is the perfect metaphor for Motorola's potential right now: an ambitious goal, and the execution is certainly closer, but we haven't quite reached the edge just yet. The big problem with everything Motorola laid out today is that it's a lot of lofty goals without much execution realized just yet. Once the event dies down, we're left with the phones. This may not be the best position to be in. Motorola still has some of its old DNA smattered across its current line of products. It's difficult to imagine that Matias Duarte is sitting over at Google HQ not cringing at the name DROID RAZR MAXX HD. I can't say for sure that this will go away. I can't know if Motorola will start releasing some outstanding pieces of hardware. No one can. The RAZR M is a good start. It occupies the "smaller" phone size market—in that it has a 4.3" display, the same size as the original Evo that helped kick off the giant phone craze. How far we've come. Still, the RAZR M isn't a flagship. It is, at best, a very nice mid-range phone. The RAZR HD and RAZR MAXX HD seem to be solid devices, but more could be done. Motorola is owned by Google now. A device that's "good enough" isn't going to cut it. People may not expect Nexuses, but they certainly want to see something close. Smartphone manufacturers are not speed boats, though. They're cruise liners. Changing course is a difficult maneuver that requires a ton of people and a lot of time. There's very little chance that Motorola put these phones together in just the four months since Google took over. What has changed, though, is the attitude. The spirit of Motorola is shifting. People have been placed in positions of leadership in the company to attempt to take it in a new direction (despite Schmidt's claims that Google bought the company but will "let you continue to run it.") What we saw today felt very much like when Google first announced Google+. The products weren't quite there yet, but you felt like this time, they get it. One of the things we grow accustomed to in the mobile world is broken promises, so we'll maintain a degree of skepticism and hesitancy going forward. But if you were looking for a reason to get excited about the new Motorola, and if you want something to base your hope that Moto phones will get better in the future, this presentation today was it.